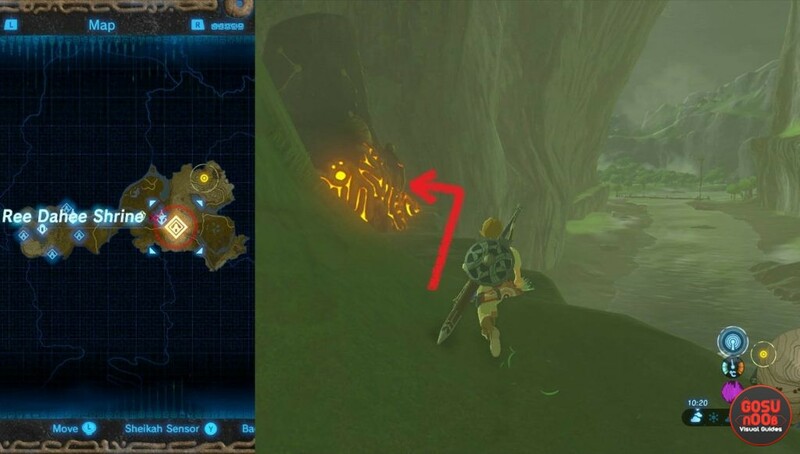 Ree Dahee Shrine can be found near the beginning of Zelda Breath of The Wild. This is definitely a shrine you don’t want to miss at the start. The reason why you should go for it is its treasure chest. It contains the Climbing Bandanna. This headpiece increases climbing speed. In this guide, we’re going to show you how to complete Zelda BoTW Ree Dahee shrine, how to beat Timing is Critical challenge. If you follow the main quest from the start, it will take you east from the Great Plateau, towards the Dueling Peaks Tower. Follow the river to the east towards the Dueling Peaks Stable. As you go into the narrow mountain passage, keep looking north. On a small elevated pathway, you’ll spot the shrine. Climb to reach it, or if you’ve been following the same path from the tower, just enter. The first Shrine challenge is to make one ball reach the other side of the platform, fall into the appropriate spot and activate the moving platform. If you step on the starting area orange switch, it will turn to blue and make the platform with the ball swing to one side. This will slide the ball into the right direction. With the help of the moving platform, you’ve reached the second challenge. This time, we need to step on the orange switch, wait for the ball to reach its starting platform, step away from the switch to return the platform into the starting position, and force the ball to activate the next moving plate. The third challenge is a combination of the previous two. This time, we need to step away from the switch, in order to make the ball fly toward the orange circle. To make it right, you’ll have to step away from the switch right when the ball is close to the end of the platform. We are not yet at the spirit orb’s location. Since the treasure chest is clearly visible from this spot, you might wonder how to reach it. Just under the Spirit Orb’s platform, there are two metal barrels. Use Magnesis to place one on the area above. Climb up and once more, use Magensis on this barrel to place it on the last Shrine switch. The one that made the last moving plate activates. … make the nearby platform swing. Climb it to reach the Treasure Chest. This action will make the last moving ball platform rise. You can now climb on it, and step in the treasure chest spot, and loot the Climbing Bandana. For the full set, you’ll need to collect Climbing Gear and Boots as well.